No alcohol of any kind is permitted in the park. Violators will be removed without a refund. 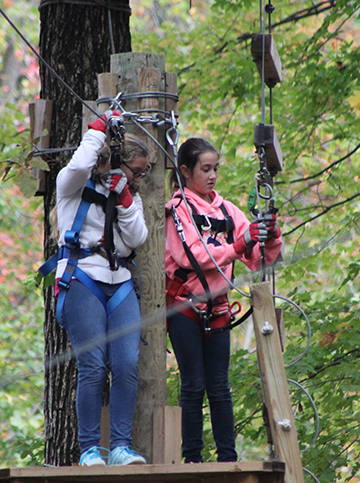 The Frankenmuth Aerial Park Waiver of Responsibility must be signed by all participants or guardians of participants under the age of 18 before they are permitted to climb. The Frankenmuth Aerial Park is a family park. We reserve the right to remove any climber who displays vulgarity, obscenity or rudeness to other climbers or to our staff. The Frankenmuth Aerial Park does not charge admission for spectators, coaches or photographers on the ground. Frankenmuth Aerial Park is not responsible for lost or damaged personal items taken onto the courses. Lockers are available in the park for a $3.00 rental fee. The minimum age for participation on the course is 7 years of age. The weight limit for participation on the course is 265lbs. The duration of a Frankenmuth Aerial Park Ticket is 2 hours and 40 minutes, including harnessing and safety briefing. The duration of a Frankenmuth Aerial Park Twilight Ticket is 90 minutes, including harnessing and safety briefing. Any ticket can be rescheduled for any reason, at any time, PRIOR to the ticket’s start time. Refunds or rain-checks will NOT be issued for no-shows. Refunds will not be issued for inclement weather. Rain-checks to reschedule the climb are available for inclement weather either before or during the climb. »Weather delay during first half of ticket’s duration = rain-check for a full climb in the future. »Weather delay during secondhalf of ticket’s duration = rain-check for half of the ticket’s value in the future. »Weather delay during the last 30 minutes of the ticket’s duration = Full climb received and no rain-check issued. Children/Youth 7-13 years of age can use the two beginner trails (Yellow) with accompaniment by an adult (Age 18+) or adult supervision from the park ground. Supervised = an adult (18+) guiding children (1-10 children) from the park ground. With Adult = an adult (18+) must accompany children on courses (2 children/adult). Rules are important for your safety!